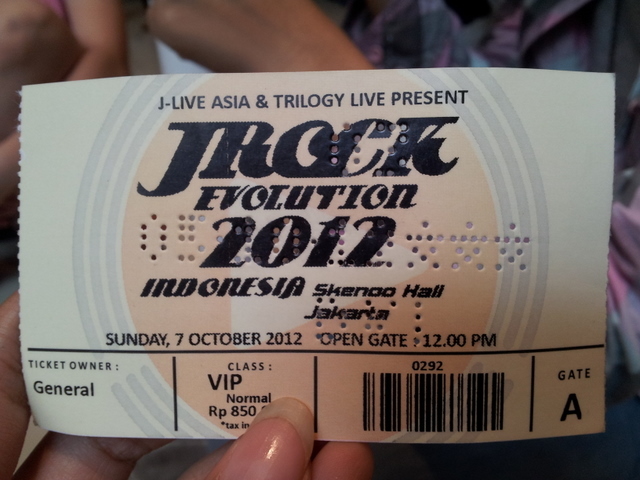 I just get back to my boarding house from JRock Evolution 2012 in Skenoo Hall, Gandaria City, Jakarta. This amazing live concert makes me feel happy and sad at the same time. Okay, now I would tell you about my experience today. 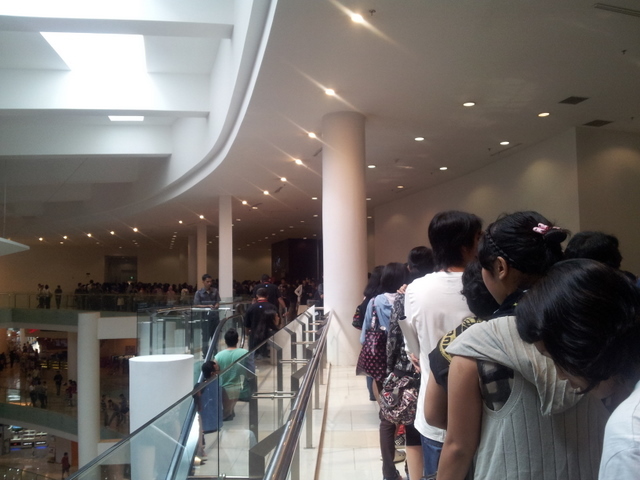 The queue in 2nd Floor to enter the Skenoo Hall in 3rd Floor. 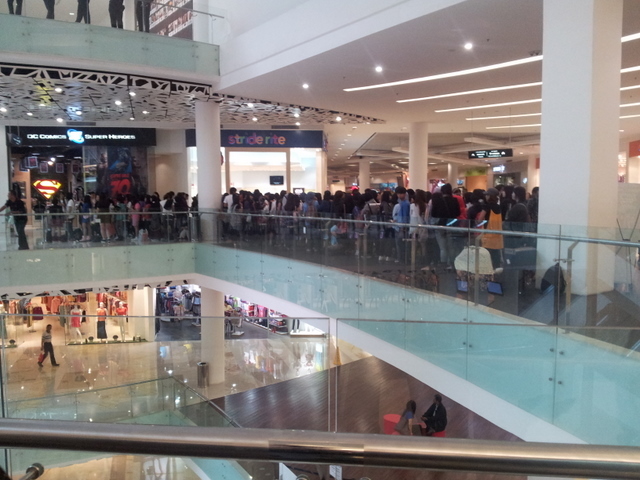 I come to exchange my ticket at 10 pm and I was greeted with this view T^T. So many people have already queuing to enter the concert venue, Skenoo Hall B, while I have to queuing to exchange my ticket in different but near location first. There are some overseas fans too. While we're queuing to go to the 3rd Floor, there's a Global PS Company Fans Club staff that was wandering around and ask fans if they have question or comment regarding Alice Nine. The questions and comments was filmed and we can watch the video later in Global PSC Fans Club homepage. The show was started from 2.30 pm. UNiTE was the first performer and they was performed for about 30 minutes. It's quite a short time nee. I couldn't post the setlist for UNiTE since I just know one of the songs that they played (>///<). It's Io, their latest single. Despite that, I dance and jump along UNiTE's performance. The Indonesia audience's reception is quite good I think. It's no wonder UNiTE says in their tweets that they're really happy. 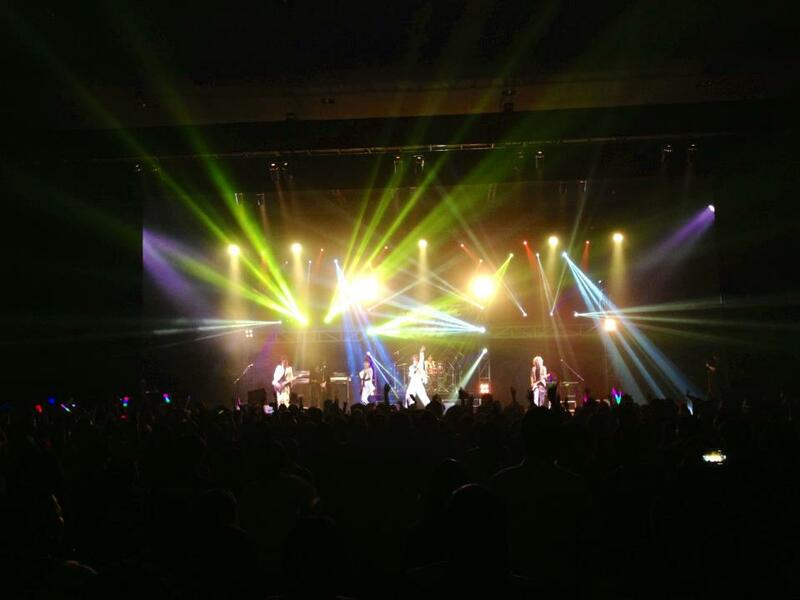 It's the first time they performed in Indonesia and the audience's response was so nice and warm. UNiTE performance was like a warming up for the next performance. Firstly I thought that the 2nd performer would be Alice Nine and the last performer would be MUCC since according to seniority, MUCC is much more senior than Alice Nine. But I was wrong. Maybe it's because a lot of Indonesia audiences that came to JRock Evolution are Number Six? I don't know too and I thought it's not a big deal. I was impressed by MUCC skill and showmanship. They made me thought, "Ah... 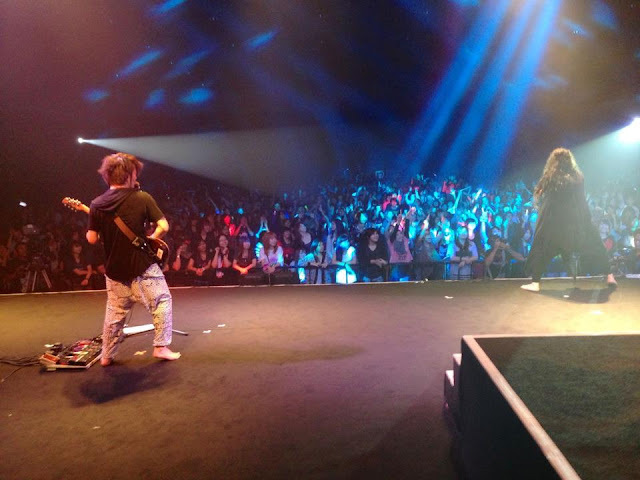 This is really a band that had enormous experience to do live concerts, both in Japan and overseas". Tatsurou-san, Miya-san, Yukke-san, and Satochi-san are a really great performers nee. Well, I expected not less than that since MUCC had been around for more than 15 years and had been performed in numerous countries ^o*. It's no wonder Hiroto-kun really respect Tatsurou-san. I love his charisma on stage and looking at his gesture was really nice. I also couldn't post the MUCC setlist here because among about 12 songs that they played, I only know Falling Down, Ageha and Nirvana (>////<). Seeing MUCC performance, the audience got more wild. Even if I don't know most of songs that they played, I dance along crazily (and so did the others). 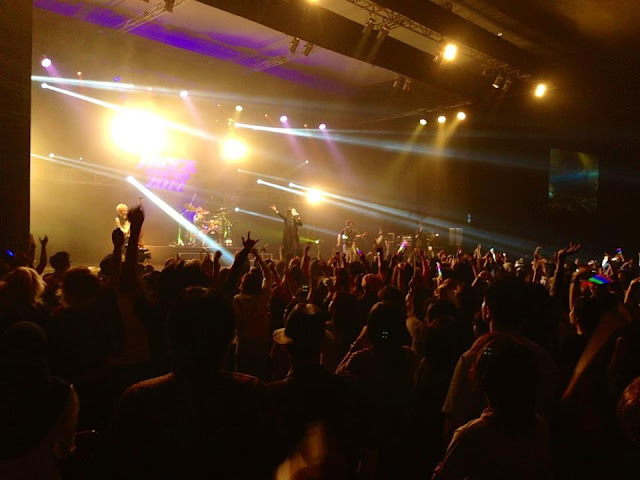 The live house atmosphere became hotter!!! MUCC is really a Japanese Band that worth to look forward! Tatsurou-san also promised us to come back to Indonesia! 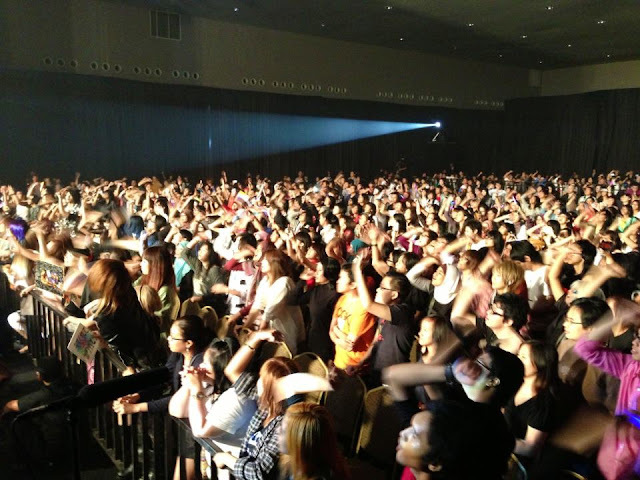 The audience in Indonesia. Hmm...I was sitting on the 5th row from the front, in the right side of the stage. Since I was focused in enjoying the performance, please correct me if I'm wrong about the setlist. All Alice Nine members looks very excited. I guess it's because they've been longing to performed overseas and the Indonesia audience singing along to all the songs and really hyper!!! What surprised me is Tora was really playful!! It's a rare sight to see him dancing crazily on stage, isn't it? And you know what? 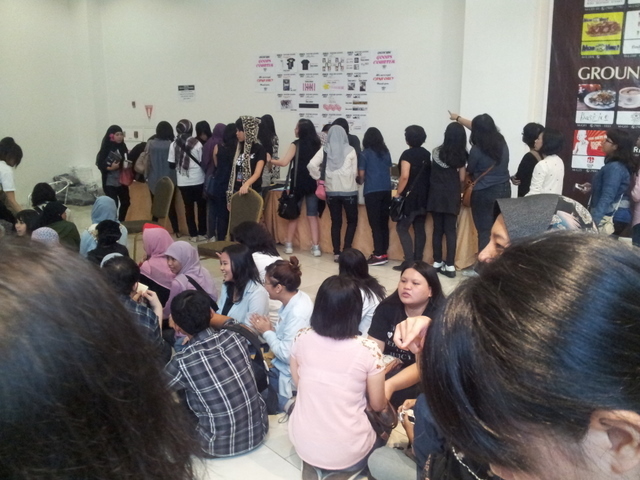 We got the chance to shout Alice Nine members' name during Haikara! Saga tease fans a lot and lick his bass after his solo (just in a short time, ok. I mean it's not like what he usually do, but I actually like this better). I think, he also lie down on stage! As usual, Hiroto-kun was really hyper ( I made a lot of eye contacts with Hiroto-kun. I'm so happy he saw me singing along to all Alice Nine songs >///<. He smile and dancing a lot in the show). He changed guitar about 3 times. The Flying V, one maroon - white guitar (maybe sadowsky guitar that he endorse) and his usual black and white Sadowsky guitar with Alice Nine name in it. There are some fanservices in the show. During Shunkashuuto, Shou kiss Saga's cheek and Hiroto-kun suprisingly kiss Tora's cheek (and what about Nao? Forever alone? Wkwkwkwk. Actually I heard that Tora touched Nao's chin and I saw Hiroto come closer to Nao a few times to make eye contacts, usually then Nao was smiling). Shou was speaking in English and Bahasa with his cute accent. Ha ha ha. It's a little bit odd but it's nice to hear and we could understand it. 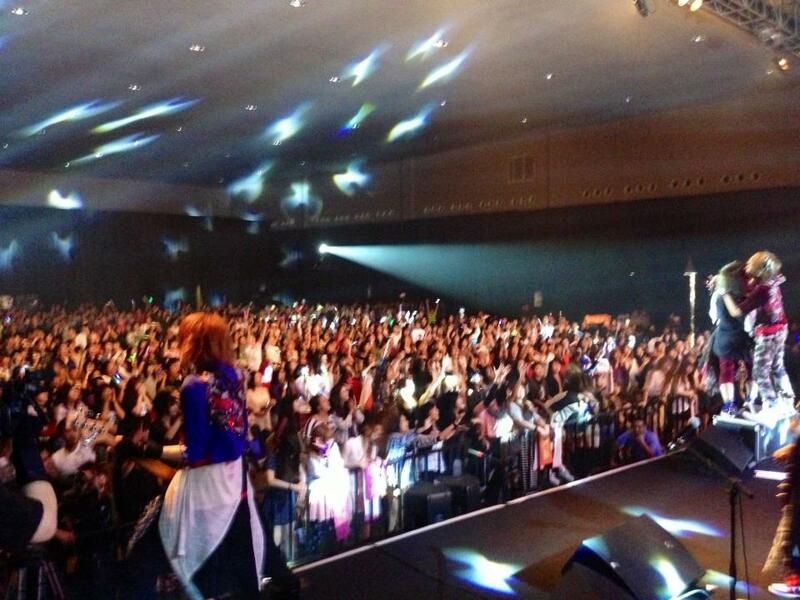 He promised us that Alice Nine would go back to perform again in Indonesia. I hope they will!!! I feel a little bit sad that they only performed for about 1 hour! I was left wanting more, but there's no encore >.<. I still can't move on until now >.<. Alice Nine, I want more! Hikz.. There's only one flaw that I found in their performance and it is the sound systems. In some songs, we couldn't hear the bass and the guitar sound clearly. In other songs, the guitar sound was echoing (I'm sorry for my bad English. I couldn't find the right word). No wonder I see a staff (maybe guitar technician??) was fixing Hiroto's sound system back and forth. This is true for UNiTe too. The sound systems was good and clear only when MUCC performed. And they spent about 20-25 minutes to do sound check to perfected their sound. They do it after UNiTE performance, and I was wondering what takes them so long. Honestly, I even complain about it in my mind because the show have to end at 6 pm, yet they spend so much time in it. But now I'm thinking about it, I wish Alice Nine spend more time to do sound check. But maybe they can't do it because of the time limitation. Moreover, Hiroto ever said in his tweet that Alice Nine didn't bring their own sound systems for the JRock Evolution so maybe there's a problem with its compatibility? Overall, the performances was amazing, the audience was hyper and I'm satisfied with it. Fans also have fun time and I would like to thanks Oishi Masahiro-san, J-Live ASIA and Trilogy Live that makes my dreams come true ^^. 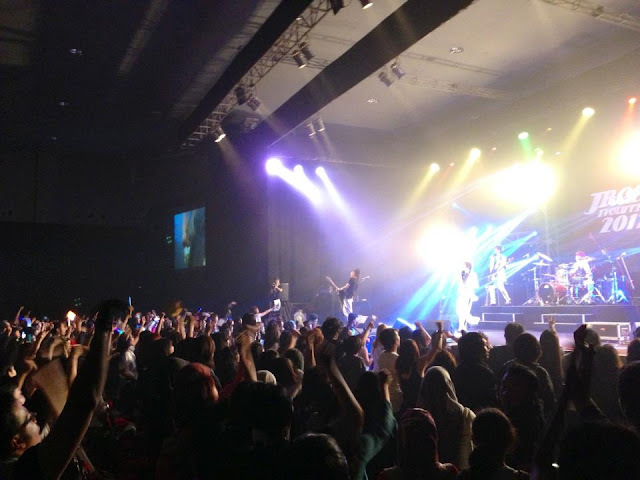 I'm surely will come if Alice Nine or MUCC held one man show in Indonesia! Thank you for reading my post too! I'm the one from the G-Dragon post ! I still remember his sweet smile when our eyes met *dies. I gave him a red "Damn, I Love Indonesia" Hoody and put it in the gift box that was provided by the staff. I think I'm going to get a mini heart attack if I see Hiroto-kun wear it (maybe in Alice Nine channel or in a picture that he tweet). >///<. Btw, maybe I'll go to BigBang concert on October 12th too. One of my best friend got a free ticket for October 12th show..
Oh, wow, he even smiled at you ? Aargh.... ! Yeah, let's hope he'd wear the hoodie and show it to us. But, either way, I think judging from how pleased the boys were with the Indonesian fans, he'd wear it even in his daily activity. It's still uncertain whether my friend will get that tickets. The company that she works for is one of the sponsor of BigBang Alive Tour in Indonesia and she gets free concert tickets pretty often ^^. She told me that her company would give her 2 free tickets (maybe for Tribun 2, just like you ^^) and she ask me whether I would like to go. I'm sorry. I have to turn down my friend's offer to go to 12 October show due to common cold. >.<. I'm sick today and couldn't even go to work. That's why I decided to take a rest today and tomorrow so hopefully I could be healthy enough to attend the 13 October show. I hope you will enjoy the show tomorrow! Aww.... that's just too bad. Yes, I hope you recover quickly and is able to fully enjoy the concert. Please get well soon !